One of the most important elements of planning a wedding is figuring out where the big event is going to be held. Start your search in Indiana. From sprawling estates just outside of downtown Indianapolis to beautiful lodges in Monticello, there's a venue to suit everyone's taste. Here are the 10 best wedding locations in Indiana! If you’ve ever dreamed of having a "rustic style" wedding inside a barn built from hand-hewn oak timbers, then Heritage Farm is your place. Listed in 2016 as one of the top 10 Bicentennial barns, it’s not a wonder many people flock to this beautiful 120-acre homestead for a wedding, or even a reception. Guests can choose to stay in the beautifully renovated guest house, a rustic, 1850s log cabin or even a suspended tree house tent! Choose your level of comfort and adventure for a truly unique venue. For a classy yet elegant wedding location, visit the Black Iris Estate in Carmel. Located just outside the busy downtown area of Indianapolis, it’s hard to imagine that such a quiet, stunning place could exist. It’s as though you’ve stepped outside and into the country, surrounded by beautiful trees and over 13 acres. The estate consists of the breathtaking mansion, gorgeous gardens, and the ceremony itself in the enchanting woods. There are three different custom venues to choose from; however, you can also custom design your venue to fit your needs with the help of one of the estate’s designers. Located within the Golf Club of Indiana is the ultimate wedding reception destination: The Cardinal Room. A 6,700-square-foot facility which can seat up to 300 guests provides stunning views of nature, the rolling green hills beyond the golf course, and first-class customer service. The venue allows for personal customization to make your day as perfect as possible, and for those interested in beverages, there are five different and unique packages to choose from: beer/wine, three different liquor packages, and a non-alcoholic package for those who wish to not serve alcohol. The Lighthouse Lodge B&B on the beautiful shores of Lake Shafer in Monticello is your next dream wedding destination. With seven deluxe suite and four two-bedroom cottages, it’s the perfect lakeside venue. Whether it’s a sunset wedding overlooking the lake or a wedding in the fall with the leaves changing colors in the background, as you stand in front of the mini lighthouse and say your vows, it’s an experience to remember. The lighthouse stands for moving forward and navigating through rough waters while standing tall, making it the perfect symbol to include in a wedding. The Jones family purchased the former Grace Church in Mooresville in 2007 and turned it into the beautiful 20,000-square-foot facility that is now known as Jones Crossing Banquet and Event Center. In 2012, they added a jaw dropping, one-of-a-kind courtyard that included a large waterfall, 70-inch promenade, top of the line landscaping and sound system. This feature alone has made them one of Indiana’s premiere wedding venues and a must have for every bride. The ballroom is absolutely breathtaking with its high vaulted ceilings and open dance floor! It can be decorated and fitted to suit your needs, from the colors to the placement of tables and more. If you’re getting married in the summer, be sure to check out their quaint Country Chic venue! 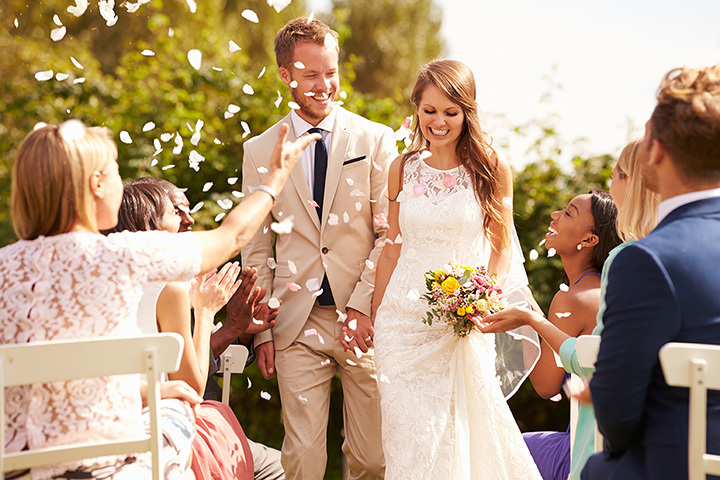 Bring the sense of freedom and rustic beauty around every corner to your wedding this year by hosting it at Meg’s Country Celebrations in Eaton. Take a tour of the picturesque outdoor greenhouse and let the smell of the flowers take you over as you make your way towards the seating area, which features chic vintage furniture and an open door that welcomes and invites guests to the special occasion. As anyone who has been married or is currently planning a wedding knows, weddings can be extremely expensive and at A New Chapter Weddings in northern Fort Wayne, Indiana, these incredible individuals are dedicated to providing you a perfect day at affordable prices. They are a small, family owned and operated establishment that provides couples with the highest level of customer service, whether it’s a small, intimate ceremony with a few guests or a large venue of over 200 guests. They also have items available to rent for the day, including the “Have and to Hold” sign, candelabras, and more! Rustic charm and wooded elegance await at the 3 Fat Labs Wedding and Event Barn in southern Greencastle, located just 30 minutes outside of Indianapolis. The property is situated on 30 acres and surrounded by what can only be described as the Enchanted Forest with its tall timber trees that give it that cozy feeling. The accommodations are pristine and modern and provide that East coast colonial vibe. And if you’ve always wanted a few friendly Labs to join the party, you’re in luck! Owners Tanya and Bill Mentgen have the sweetest four-legged helpers eager to assist you in making your special day just so! Located in southern Bloomington, Indiana is the historic, lavish, Tuscany style Deer Park Manor, which was built and remodeled between 1953 and 1956, and is presently owned by the Fitzgerald family. The property also serves as a nature preserve to creatures like deer, red fox, and exotic wildflowers. Mixed in between new materials are the remnants of the old limestone quarry that used to exist. The property has even seen some infamous guests including former presidents Richard Nixon and Dwight Eisenhower. It’s a retreat unlike any other and guests will imagine they’ve stepped into a faraway land just outside downtown Bloomington. A high-quality, family owned and operated venue focused on social gatherings, fundraising, corporate meetings, and of course, weddings is what visitors will find at the Ritz Charles located between Meridian and Illinois street in Carmel, Indiana. The facility is 15,000 square-feet and is complete with a renowned culinary staff, outstanding, professional servers, dedicated managers and amazingly talented event specialists, all of whom make it their mission to make your day the absolute best that it can be.